According to tradition the Skenes were an early sept of Clann Donnchaidh long before it adopted the name of Robertson. The progenitor of the Skenes was a younger son of Robertson of Struan who according to legend saved the King, Malcolm Canmore by killing a wolf with his sgian (knife) and was thus granted as much land as could be covered by a hawk's flight which came to be the lands and lakes of Skene in the Forest of Stocket Aberdeenshire. John de Skene appears on the Ragman Roll in 1296 swearing fealty to Edward I . His grandson Robert de Skene however was a firm supporter of Robert the Bruce, from whom he received a charter in 1318 erecting the lands of Skene into a barony. His grandson, Adam was slain at the Battle of Harlaw in 1411 fighting against the Lord of the Isles. Alexander Skene of Skene, 4th chief fell at Flodden in 1513 and his grandson, Alexander also fell at Pinkie in 1547. James Skene of Skene was a loyal supporter of King Charles I but for his support he had to flee to the continent where he served with Gustavus Adolphus, the "Lion of the North". He died before the Restoration but his sons appear to have adhered to the new government. The family of Skene of Skene became extinct in 1827 after holding their lands throughout the troubled years of the 17th and 18th centuries. The property was entailed to a nephew, James 4th Earl of Fife, and the chiefship passed to the family of Skene of Hollyands who descended from Andrew of Auchorrie, 2nd son of James Skene, 12th chief of that Ilk who died in 1605. Other cadet branches include the Skenes of Preraw who settled in Austria, Dyce, Cariston, Pitlour and Rubislaw. One notable historian, William Forbes Skene belonged to the Skenes of Rubislaw and was appointed Historiographer Royal for Scotland in 1881. ACCORDING to a popular tradition, the founder of this ancient Aberdeenshire family was a valiant individual who, early in the eleventh century, distinguished himself by rescuing King Malcolm II. from the attack of a ferocious wolf, which he slew with his skean or dirk. It is a story similar to that of the young fprester, who, after carrying off Malcolm�s daughter Cora at the Falls of Clyde, saved that king�s life three times at the great battle of Mortlach, and was rewarded with lands on the lower Cyde to which he gave the name of Eri-Skene, or Erskine, which had been his war-cry on the battlefield. It is much more likely that the families of Skene and of Erskine took their names in the usual way from the lands on which they settled. From time immemorial Skene has been a place-name quite apart from any connection with either of these families. Loch Skene, the famous fishing loch in Moffatdale from which descends the highest waterfall in Scotland, the Grey Mare�s Tail, has no such personal association. A much more believable tradition is that the Skenes are a branch of the Clan Donchadh or Robertson. The founder of the branch, according to the antiquary and Highland historian, Dr. W. F. Skene, was the second son of a Robertson Chief, and was himself known as Donchadh mor na Sgine, or Big Duncan of the Skean. The latter part of his designation, we may suspect, was derived, not from his weapon, but from the lands on which he settled. The Robertsons are believed to be the descendants of Conan, second son of Henry, last of the old Celtic Earls of Athol. Henry�s eldest son had daughters only. Through them the earldom and the lower lands of Athol passes to Lowland families, while the Robertsons retained the upper and wilder districts. The newer or Lowland race of Earls, however, gradually ousted the Robertsons from large parts of their inheritance, and it is believed to have been during this process that Dunchadh Mor migrated across the hills to Deeside, and settled there on the lands about Loch Skene, which were to form the patrimony of his descendants for so many centuries. John le Skene and his son Patrick, who signed the Ragman Roll in 1296, are believed to have been son and grandson of Dunchadh Mor, and it is believed to have been Patrick�s son who received a charter of the family lands from King Robert the Bruce in 1318. This charter runs, "Roberto Skene, dilecto et fideli nostro, pro homagio et servitio suo, omnes et singulos terras de Skene, et lacum ejusdern, per omnes rectas antiquas metas et divisas suas," etc. In warlike affairs the family was consistently loyal, brave, and unfortunate. In 1411, when Donald of the Isles with his Celtic host swept across the north of Scotland with the intention of forcing the Regent, Robert, Duke of Albany, to disgorge the Earldom of Ross, the Laird of Skene raised an armed force, joined Albany�s nephew, the Earl of Mar, and fell with many others of the gentlemen of the North at the bloody battle of Harlaw. To meet the occasion, Adam de Skene had raised money by a wadset on his estates, and for many years this proved a serious burden to his successors. A century later, when James IV. mustered his forces on the Boroughmuir of Edinburgh to invade England, Alexander Skene of Skene was among those who obeyed his summons, and fell with the too chivalrous monarch on Flodden Field. The grandson of this laird again, another Alexander, fell at the battle of Pinkie in 1547, when the Scots were endeavouring to protect their capital and save the country and the infant Queen Mary from the "rough wooing" of the English Protector, Somerset. Still later, after Queen Mary�s return from France, when the Queen�s brother Moray was at the beginning of those insidious plottings which in the end were to bring Mary to the scaffold at Fotheringay, and when, in the north, the Earl of Huntly made his great effort to resist these schemes, the Laird of Skene joined Huntly�s forces and fell with that Earl and so many of his friends and vassals at the close-packed fight of Corrichie. Skene�s youngest son and several of his kinsmen also fell in the same battle. Notwithstanding these disasters the family survived, and in the succeeding centuries, by marriage and purchase added great areas to their possessions. Additions were made to the grim stone tower which is said to have been the first house built of stone and lime in the district of Mar, and to which access could only be gained by means of a ladder reaching the second floor. At the same time several branches of the family established themselves in Aberdeenshire, notably at Dyce, Hallyards, and Cariston. 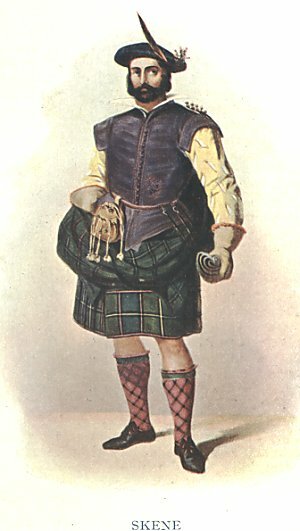 As the Macphersons cherished the Black Chanter of Clan Chattan, while the Macleods treasured their Fairy Flag, and other clans of the West kept certain relics as trophies, charms, and incentives, the Skenes preserved a dirk, said to be the original skean of the founder of their house, Dunchadh Mor. This antique weapon was kept in the family charter chest, and on its safe custody was believed to depend the tenure of certain lands. The senior line of the Skene family came to an end at the death of George, the twenty-first chief, in 1824. On that event, Skene and Cariston, the possessions of the house, passed to his sister�s son, the fourth Earl Fife, who attained high distinction in the Peninsular War. This peer�s nephew, the fifth Earl Fife, was created Baron Skene in the Peerage of the United Kingdom in 1857, and it was his son who in 1889 married the eldest daughter of the Prince of Wales, afterwards King Edward, and was created Duke of Fife. Apart from its territorial importance the family of Skene has contributed a number of distinguished figures to the annals of Scotland. Gilbert Skeyne, who died in 1599, was Professor of Medicine at King�s College, Aberdeen, in 1556. His Brief Description of the Pest, printed in 1568, was the earliest Scottish medical work; and he was appointed doctor of medicine to King James VI. in 1581. Sir John Skene, who died in 1617, began as a regent in St. Mary�s College, St. Andrews, in 1564, became an advocate in 1575, and was granted a pension by the Regent Morton for his digest of the Scottish laws. He accompanied James VI. to Denmark and was ambassador to Holland in 1591. As King�s Advocate he took a zealous part in prosecuting witches, and was made a Lord of Session and Lord Clerk Register with the title of Lord Curriehill in 1594. He was one of the Octavians, and a notable author on Scottish law. His son, again, Sir James Skene, became President of the Court of Session in 1626, and was created a baronet of Nova Scotia in 1630. Sir James�s brother, John Skene, who died in 1644, was the reputed compiler of "Ancient Scottish Melodies," printed in 1838. James Skene, the friend of Sir Walter Scott, was a member of the Scottish Bar, and Secretary to the Board of Trustees and Manufacturers. He edited Spalding�s History of the Troubles, in 1828, produced a "Series of Sketches of Existing Localities," alluded to in the Waverley Novels, in 1829, and was the author of manuscript memoranda utilised by Lockhart in his life of Scott. He lived for six years, from 1838 till 1844, in Greece. The daughter of this savant, Felicia Mary Skene, was the authoress of a volume of poems, several novels, and memoirs of her cousin, Alexander Penrose Forbes, and rivalled the work of Florence Nightingale of the same period by organising a band of nurses under Sir Henry Wentworth Acland during the outbreak of cholera at Oxford in 1854. And last of all, there was this lady�s brother, William Forbes Skene, author of The Highlanders of Scotland, The Four Ancient Books of Wales, and Celtic Scotland, and editor of Chronicles of the Picts and Scots, and Fordoun�s Scotichronicon. He held the office of clerk of the bills in the Court of Session, was made a D.C.L. of Oxford in 1879, and Historiographer of Scotland in 1881. Septs of Clan Skene: Cariston, Dyce, Hallyard.